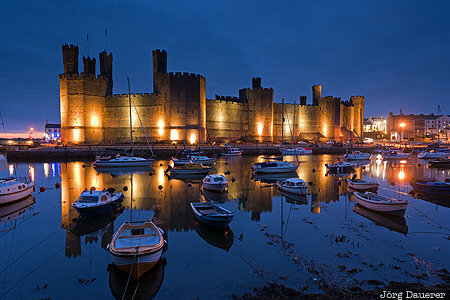 The flood-lit medieval fortress Caernarfon Castle at the blue hour after sunset behind small fishing boats and its reflexions in the water of the harbour of Caernarfon at high tide. Caernarfon is in the north of Wales, United Kingdom. This photo was taken in the evening of a sunny day in June of 2015. This photo was taken with a digital camera.